Sarah Hagan has been through the ringer. After her divorce and a turn at a self-involved attorney, she has given up on romance and love. That is until Carlos enters her life. But as he’s her patient, he’s untouchable, leaving her with dreams both terrifying and exciting. But there’s more to Carlos. As she regresses him with hypnotherapy, she discovers an unusual presence, an alter ego that claims to be a phantom vampire. Who is Aris and what does he mean to Sarah? 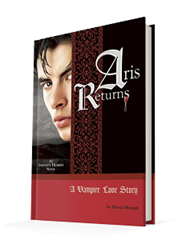 Published October 30, 2012, by BroadLit, Aris Returns by Devin Morgan is the first in her paranormal romance Infinity Diaries Trilogy. Talk about a bad romance. And no, this book is nowhere near as good as Lady Gaga’s song. Where to begin. This book was a disaster. It follows a therapist and her on going treatments of Carlos, a parolee who is trying to change his life. But in the therapy sessions the reader discovers that there is another personality within him, a vampire. That probably should have been the hint that this novel wasn’t going to go anywhere good. But it could have. It had some strong elements to it, but the biggest problem is the fact that the novel is boring and serves more as a history lesson than a romance novel. There is hardly any tension in the novel to capture the reader, and after a point, Aris the Vampire’s narrative becomes increasingly boring and tedious to follow. He’s just a bore. And there really is nothing romantic about him. In fact, he’s more sinister than anything, tapping into the cliché that everyone loves the bad boy. Carlos is more lovable than this vampire parasite, and readers don’t even get to know who Carlos is. Sure, the author did a good job of presenting his backstory, but as for who he is and what drives him in the present, well, all the reader knows is that he’s incredibly good looking, as if that’s supposed to mean something substantial.